The number of people driven from their homes by wars and persecution has hit a record high , with the majority stemming from just three countries. Annual data released by the UN refugee agency (UNHCR) show that the number of displaced people in the world topped 65 million last year, for the first time in the agency’s history. More than 21 million were refugees, 40.8 million were internally displaced persons, and 3.2 million were asylum seekers. On average, 24 people were displaced from their homes every minute of every day during 2015, compared to six per minute in 2005, according to UNHCR. Of the 21.3 million refugees, 16.1 million were under UNHCR’s protection or “mandate,” and 5.2 million were Palestinian refugees protected by the separate United Nations Relief and Works Agency. 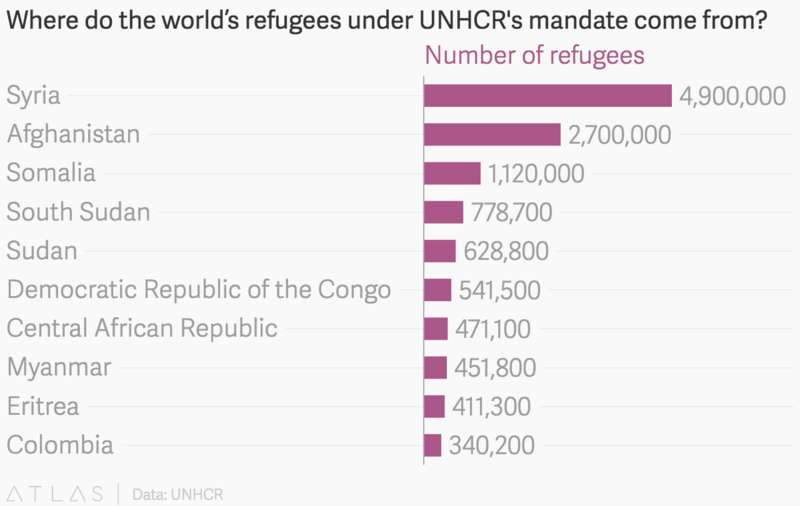 Just three countries make up more than half of the world refugees overseen by UNHCR across the world: Syria (4.9 million refugees,) Afghanistan (2.7 million refugees) and Somalia (1.1 million refugees). Neighboring countries hosted the vast majority of Syrian refugees, including Turkey (2.5 million), Lebanon (1.1 million), and Jordan (628,200). Outside the Middle East, Germany (115,600) and Sweden (52,700) were notable host countries for Syrian refugees. The UN has on numerous occasions called on global leaders to step up and host more refugees fleeing Syria’s ongoing civil war. The majority of Afghan refugees resided in Pakistan (1.6 million) and Iran (951,100), while the majority of Somali refugees resided in Kenya (417,900) and Ethiopia (256,700). Many hoped that the publicly documented drowning of Syrian refugee Aylan Kurdi last year would be a wake up call to European leaders to respond to the growing refugee crisis. While the viral photos of the drowned toddler led governments to soften their response , several pledges to resettle refugees have failed to materialize. Refugees trying to reach Europe are quickly running out of options. The Balkan route into Europe was effectively sealed earlier this year when Hungary, Austria, Macedonia, and Slovenia responded to the crisis by building fences on its borders.